You are currently browsing the The Pet Product Guru blog archives for the day Thursday, August 8th, 2013. Oftentimes, pets are absolutely shameless about their bathroom habits. The typical male dog is proud to stake his claim on a fire hydrant or tree in plain view of everyone else in the neighborhood. On the other hand, certain cats prefer a little privacy when they do their business – and who could blame them? An enclosed litter tray shelters them from what they might perceive to be glaring eyes. 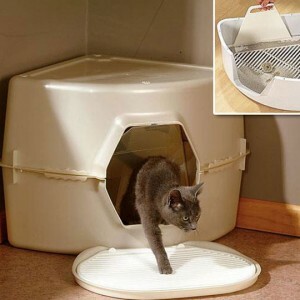 The benefits of a litter box cover are actually two-fold. It’s great to make your pet more comfortable by lending privacy, but the cat owners’ needs matter too. Enclosed trays cut down on unpleasant odors – albeit temporarily – in case company comes over unexpectedly. Nothing stops conversation dead in its tracks like potent pet odor, so any attempt to alleviate it should be welcomed with open arms. Listen to great music on THE EDGEWATER INTERNET RADIO NETWORK while you change you kitty’s litter box.